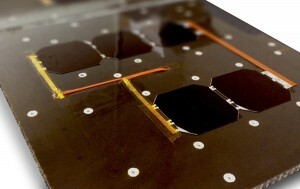 Solar panels are the preferred energy generation equipment available for small satellites. The solar panels GAUSS Srl uses are manufactured by the partner company DHV Technology, expert in the field of solar panels suitable for small-sized satellites and customizable according to the satellites structure. All GAUSS Products (Structure, etc.) are compatible with DHV Technology solar panels. As in UniSat-6 case, the above-mentioned innovative solar panels technology will be part of UniSat-7 mission, to be used to provide power to the satellite bus and relative payloads. Solar panels can also be integrated on-board the satellite as IOD payload for testing purposes and flight heritage. To find out more you can contact us here.